The diagnosis of hypertrophic cardiomyopathy involves several types of tests. This includes physical examination, echocardiography, MRI, and cardiac catheterization. physical exam yet still have a life-threatening condition. 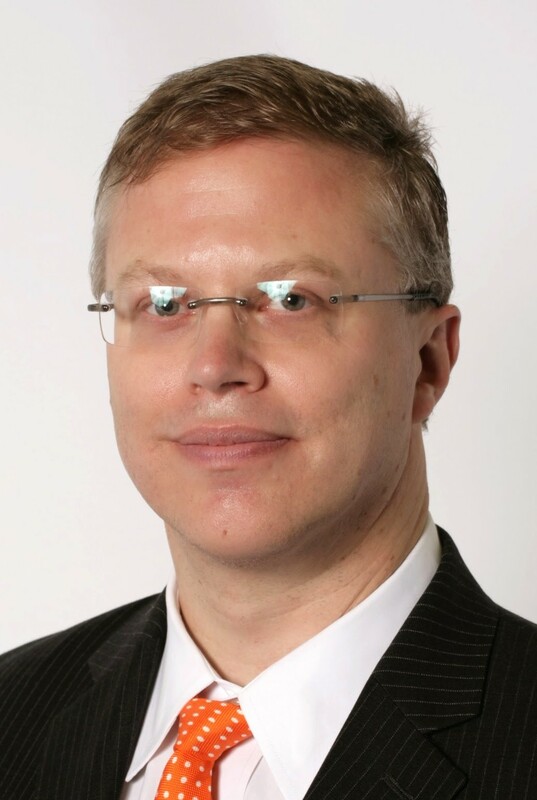 Patients with a family history should be screened more aggressively however many patients with hypertrophic cardiomyopathy have no family with the disease. 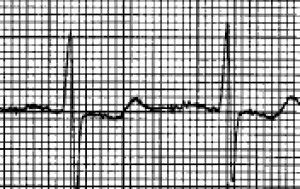 In HCM, the voltage of the ECG is typically larger than normal due to more muscle mass. Click to enlarge. Testing for this condition usually starts with an ECG (electrocardiogram) and echocardiogram (echo). The ECG typically with show higher voltage indicating more muscle to generate more voltage. 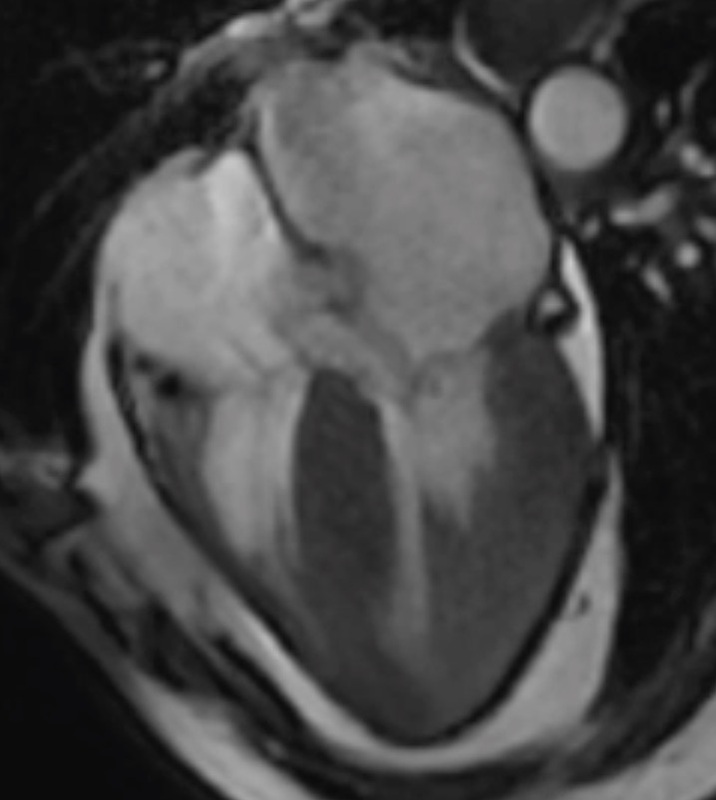 MRI (magnetic resonance imaging) is quite helpful for visualizing the enlarged myocardium and its characteristics. 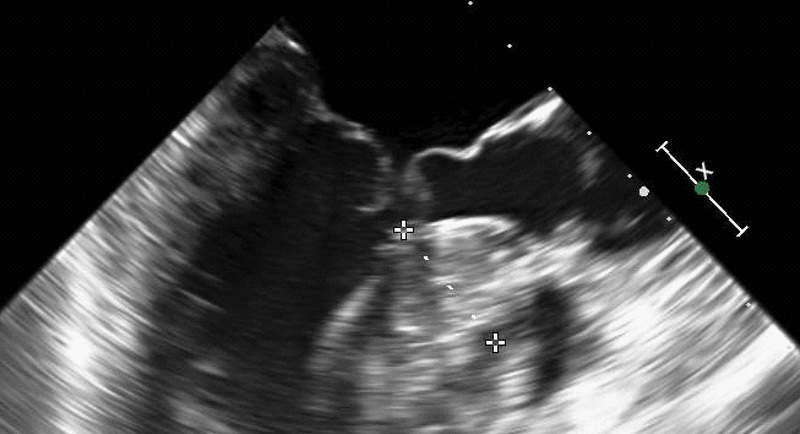 Transesophageal echo of a patient with HCM and severe obstruction. Click to enlarge. of the left ventricular outflow tract (which is where the blood passes out of the heart and can be obstructed in hypertrophic cardiomyopathy). This depicts a 4 chamber view of the heart on MRI in a patient with HCM. Click to enlarge. The TEE can also help to more clearly see the mitral valve and understand its anatomy. In many cases, one of the leaflets of the mitral valve actually gets caught in the blood flow as it leaves the heart and contributes to the obstruction of blood flow leaving the heart (this is called SAM or systolic anterior motion of the mitral valve). Other test often obtained include a chest xray, a cardiac catheterization, and a Holter monitor (monitors heart rhythms). 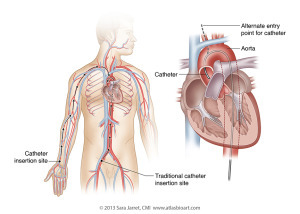 Cardiac catheterization can be done through an artery in the leg or the arm. Click to enlarge. 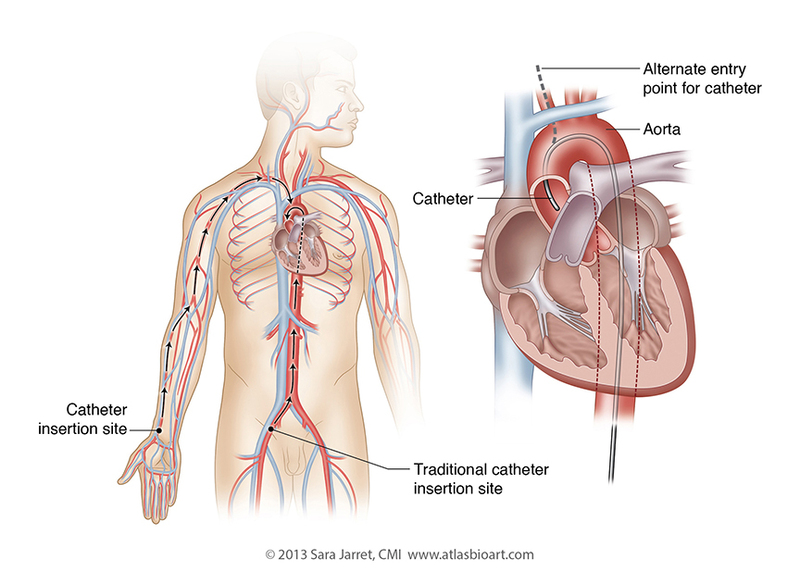 The cardiac catheterization is performed not only to confirm the pressure gradient (amount of blockage) between the heart and the aorta (pipe that takes the blood to the body) but also to see if there is any coronary artery blockages. If these are present, the patient might receive additional procedures to correct the problem.